The thought of things coming to an end is scary. But the fact that our time together is limited is also what defines it, it's what makes that time so special. 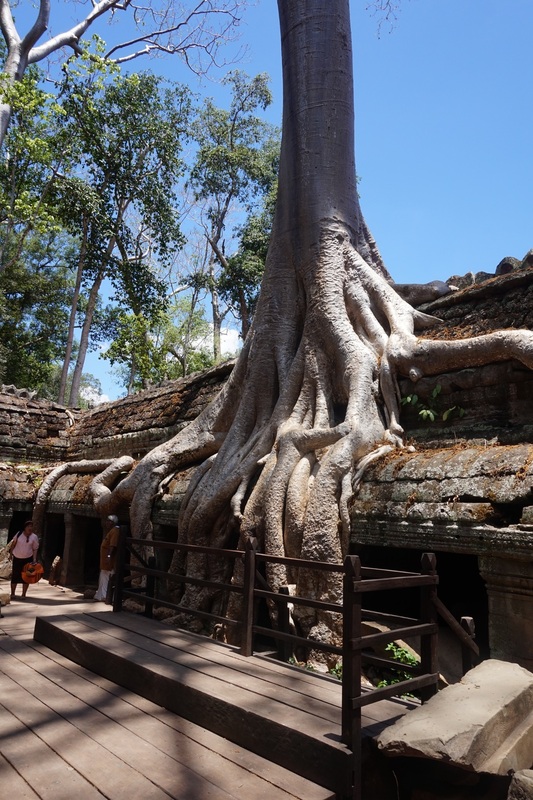 This post is a week overdue, but I'll be honest I don't have anything super interesting to say about Angkor and I don't believe in forcing writing. The temples give off a powerful aura of history, there is a quiet calm and appreciation for how old they are as you walk through them. Its funny how every experience prepares you for the next one, how taking a step off the paved road onto the dirt makes the next one just a little bit easier. Before you know it you find yourself deep in the woods and you've completely lost sight of the paved road. Some steps are bigger than others, sometimes you know what you'll be stepping into, other times what looks like dirt can turn out to be quicksand, or the softest of sands. After two days of roaming Bangkok, soaking in backpacker culture on Khao San road and savoring the plethora of late night drunk food we were itching to get out of the city and off the trail to see something a little different. Three hours north lay Khao Yai, Thailand's largest national park boasting wild elephants, monkeys, Tigers, deers, and a totally unknown Thai wilderness. A tour company offered to book us transportation, food, lodging, and a guide for $90. HA, LOL, yeah right, we've been scammed a couple times already and being the experienced veteran travelers that we had become after 3 whole days, we laughed off the tour offer and decided to do things on our own. Spoiler: What should've been a $30 trip ended up being $63 for the day after being scammed by the bus company on the way there...... IN OUR DEFENSE who'd expect a bus company to scam you right? Oh well, sometimes you've got to step through the mud to find the grass. We took a nauseating minivan three hours north to get to the park unknowingly having been charged 500% more than the other (non-foreign) passengers. I downloaded a bunch courses on photography, drawing and calligraphy before I left Boston so I spent most of my time watching a photography course on the way up. I sat next to a monk who I showed my Dhammapada to, he beamed back at me and tried to flip through it but was unable to understand the English we had a couple more head nods and smiles and then both returned to what we were doing. 8pm hit, Carlos, the monk and I were the only ones left on the bus that was speeding down long dark windy roads. The bus suddenly pulled over on what looked like bumblefuck nowhere, there were two small buildings, one with a sign for a coffee shop, there was no one in sight and no streetlights. I looked at the monk and asked "Khao Yai? ", he smiled and nodded and said "Khao Yai." The first thing i noticed when I walked outside was just how loud the forest was. We walked into the coffeeshop where two parents were playing with their daughter on the floor. "Hostel? Sleep? Guesthouse?" I put my hands together by my head. "Yes yes!" The man got up and walked us outside where four bungalows awaited. I was absolutely starving so I left Carlos and went out to find food. Ten minutes down the street was another family eating dinner outside in what looked like a restaurant that they owned, the only thing I could communicate was chicken pad Thai which they cooked me for 40 baht ($1). While waiting for the food I saw what is probably the biggest Beatle I've ever seen, about the size palm. I paid for the food and heard a crunch above me, I looked up to see a gecko with the aforementioned Beatle hanging out of its mouth. Jet lag woke me up at four that day, I began to look into how/where we should visit in the park and came to the unfortunate realization that the park center/where most hikes leave from was, well, in the center of the park, 12miles from where we were. Motorbikes and hitchhiking were our two options. So at four AM I began watching you tunes videos on how to drive a motorbike... Convinced that I'd be able to figure it out, even though there were two of us with backpacks and they drive on the opposite side of the street that we drive on in the states. Carlos woke up at seven and thankfully talked me out of my absurd idea. We had breakfast alongside some deer. The first hike was poorly marked and overgrown so they made us hire a guide, and we were off. Out of the 274 pictures I took of the park, this is my favorite. 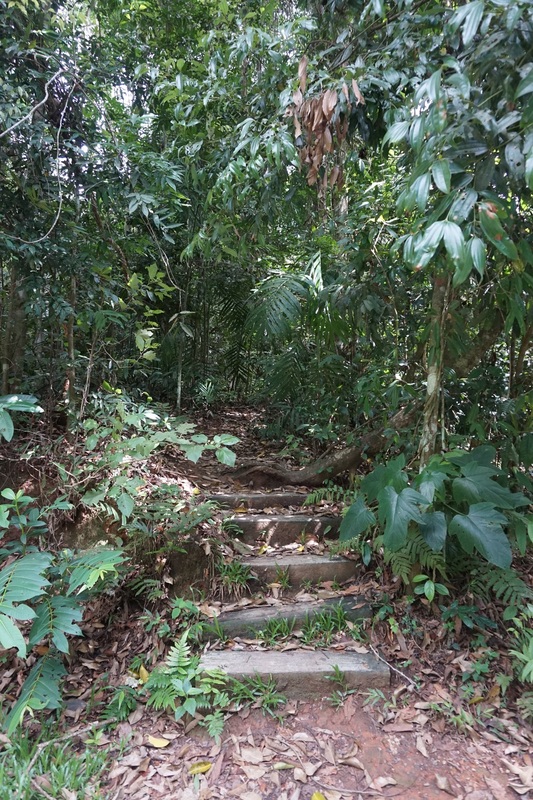 The first hour of the hike was through the thick jungle among the massive trees. If there ever was a place to inspire the jungles of Tarzan this would be it. The jungle was so loud. It felt like chainsaws were constantly going off, it was a constant cacophony of sound. There are times in life where you walk into a place so vast and so beautiful that nothing could've prepared you for it. No image, no video, no description can adequately come close to describing what that place feels like. The colors feel brighter, you feel more aware of the smells and movement of everything and it feels like the wind is going through you. Backpacking in Yosemite felt that way, the cedar forests of Lebanon felt that way and most recently, seeing the Taj. It's what happened after we broke the out of the thick jungle brush in Khao Yai. After waiting for around forty minutes to hitchhike back out of the park these awesome people picked us up and gave us a ride back out to the bus station. So I could sit here and write about everything I did, where we went, the things we saw, smelt and felt. But I don't think that'd be much fun to read or write for either of us. So I'm going to go a little bit into what we did, but more importantly I'm going to write about the things we experience and the things I've learnt/thought about. We've spent the last two days exploring the city of Bangkok, in short, it's a full overwhelming of all the senses, reminding me of India. From the Tuk Tuk drivers, to the abundance of food stands, to the bright and vibrant colors of clothing. The city itself is massive, it's incredibly wide and a mix of gorgeous new upscale skyscrapers and older more run down apartment buildings. Bliss is walking down a bustling street in Bangkok, with nowhere as your destination and no time you need to get there by. Pure and utter freedom. You stop in whatever food stall calls to you, whatever coffee shop looks interesting, and when you want to move on you just hop in a tuktuk, it feels weightless. It's just been two days, but I've adored this feeling, especially when you're with like minded people who completely embrace it. I cant wait to spend three months chasing it. 2 Tobacco pipes + supporting cast, I'm bringing two, because what's the point of a pipe if you can't share it? I could do everything that my iPad and Camera do with my iPhone. However, I want a break from my phone, from the constant buzzing of notifications, from the mindless unlocking/locking of the screen. Bringing an iPad and camera will force me to be deliberate about the things I do and the pictures I take. 16 hours till departure. I can't wait.